Cassandra is a distributed database management system built to handle massive data sets while providing high availability without compromising performance. That’s why many organizations use it for their mission-critical data. That being said, if you are running Cassandra then you’ll want to keep close tabs on it. Sematext just added Cassandra monitoring to its growing set of database monitoring integrations, along with Cassandra alerting & anomaly detection on any of the monitored Cassandra metrics. Why Not Monitor More Than Just Cassandra? Unlike some of the tools that only monitor Cassandra and nothing else, SPM Performance Monitoring covers Cassandra, the competing database HBase, and a lot more: Solr, Elasticsearch, Hadoop, MySQL, AWS CloudWatch, Memcached, Apache, and just about any other app you want to monitor. SPM also monitors Storm and Kafka, which are often used together with Cassandra (considered their most popular data store). Now all three can be monitored together! 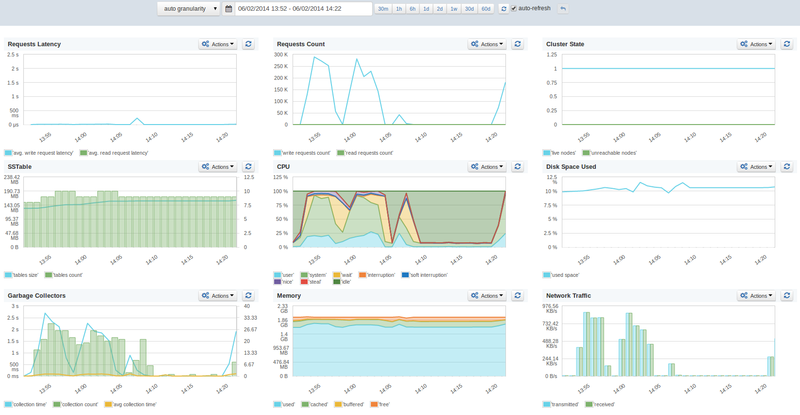 Have a look at a few of the screenshots to see how we graph Cassandra metrics in Sematext (a list of Cassandra metrics we monitor is listed further below). You can also check out Sematext live demo. See the full list of Cassandra metrics in the docs. Please tell us what you think – @sematext is always listening! Is there something that you would really like to monitor with Sematext? Many organizations tackle performance monitoring with a mish-mash of different monitoring and alerting tools cobbled together in an uneasy coexistence that is often far from seamless. Think Graphite+Nagios, for example. Sematext Cloud takes all that hassle away and makes it easy and comprehensive in one step. Try Sematext for free for 30 days by registering here. There’s no commitment and no credit card required.